The number of my github projects is growing (more than 100), so is the number of my blog posts. It has reached the point where finding a blog post or a project about something specific became a pain. Usually I search the local Markdown files instead of searching the actual blog website. I use the built-in github search to find a particular github project. This was all very slow and inefficient. 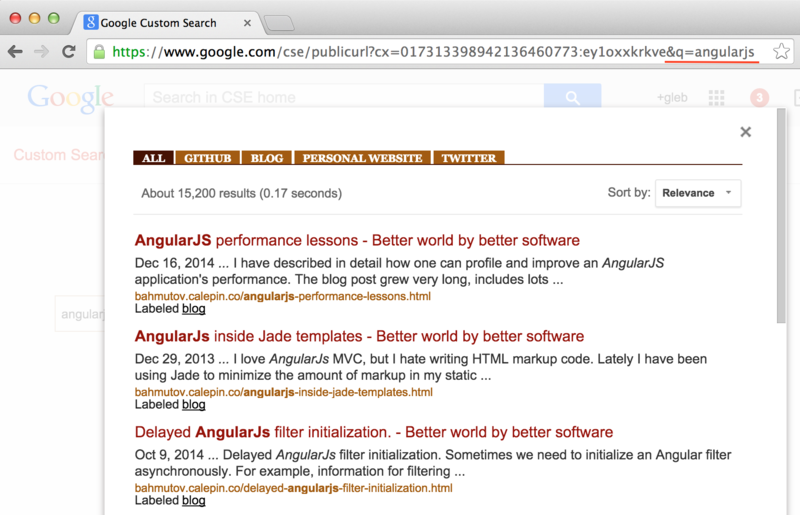 Finally I have decided to create a combined search app across blog posts and github projects. I made it very quickly using Google's custom search feature. You can try the result yourself. Open glebbahmutov.com and click "search". 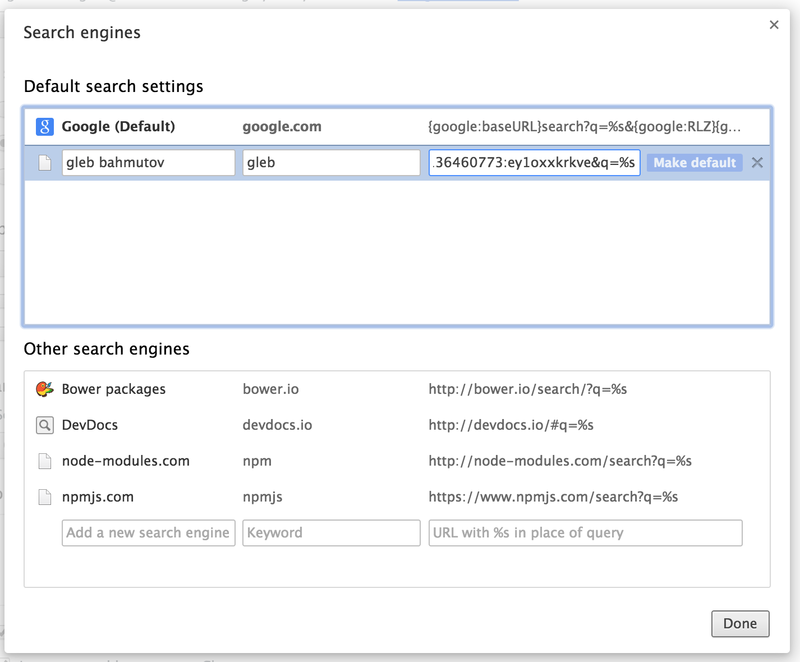 The search widget opens up, enter a few words, such as "code performance" and click "Search". I can click "github" or "blog" tabs on the top of the results to only show found results from my github account or blog post. Here is how I made this custom search happen. Start by going to the new custom search page and enter the basic information. For example, I named my website "Gleb Bahmutov". Immediately you get a custom long search url that will lead anyone to your custom built page. In my case it is this url. 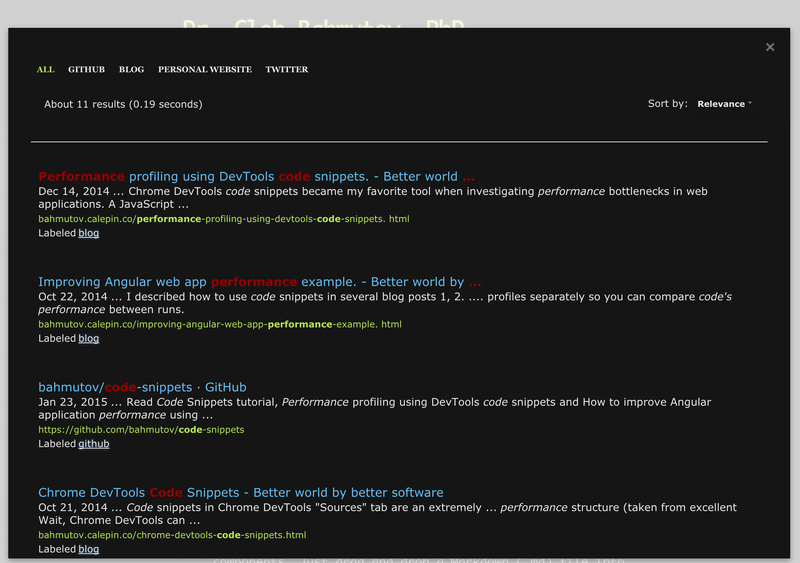 First, I created a couple of labels that will divide my search results: "github", "blog", "personal", etc. 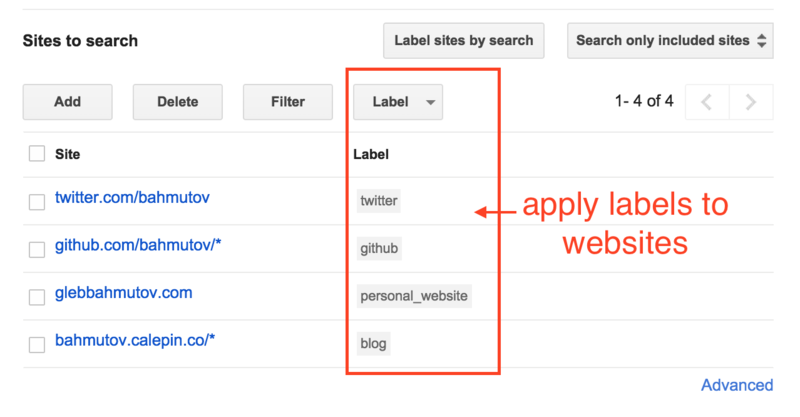 These labels will show up as tab headers on the top of the results overlay and will limit results to come from a specific domain or several domains, because when creating each label I selected "Search only the sites with this label" option. 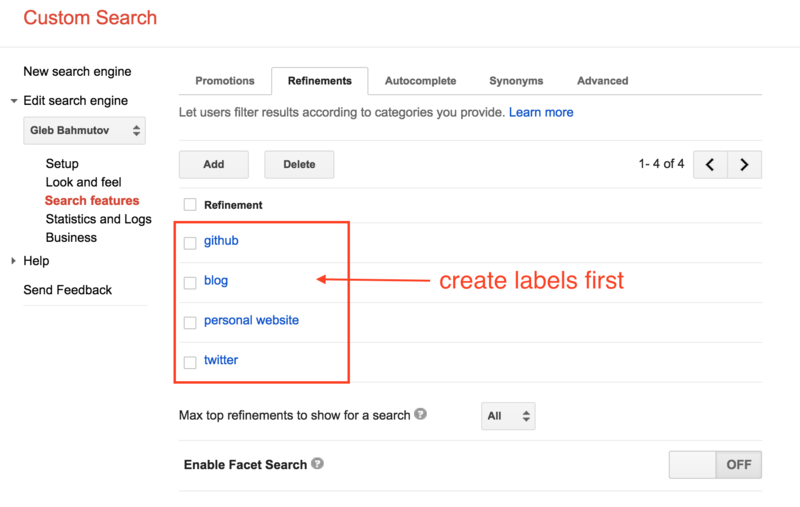 To choose the domains for a label, just apply the label to a site in the first setup page. Notice the search wildcards - I am searching the blog's index page and all its sub pages and any page starting with github/bahmutov. The search automatically opens the overlay and displays the search results. The default widget does not match my website's visual style, and the built-in customization options are insufficient to make it do so. Thus I overrode the widget's elements' styles using CSS stylesheet. Most of the settings used !important qualifier. Instead of bookmarking this long url, you can paste it into the chrome://settings "Manage Search Engines" as a new engine. I added new engine with keyword "gleb" and the custom search url plus added search placeholder ...xkrkve&q=%s. Now when I want to find my blog post or a project, I start typing "gleb", then press Space to direct my search query to the custom url. Now, I can kick off the custom search by going to the short url glebbahmutov.com/?q=<search terms>, for example q=improving+performance. If you are working on OSX, you probably use Spotlight App. I prefer Alfred free edition. It seems a little more advanced and is highly customizable. 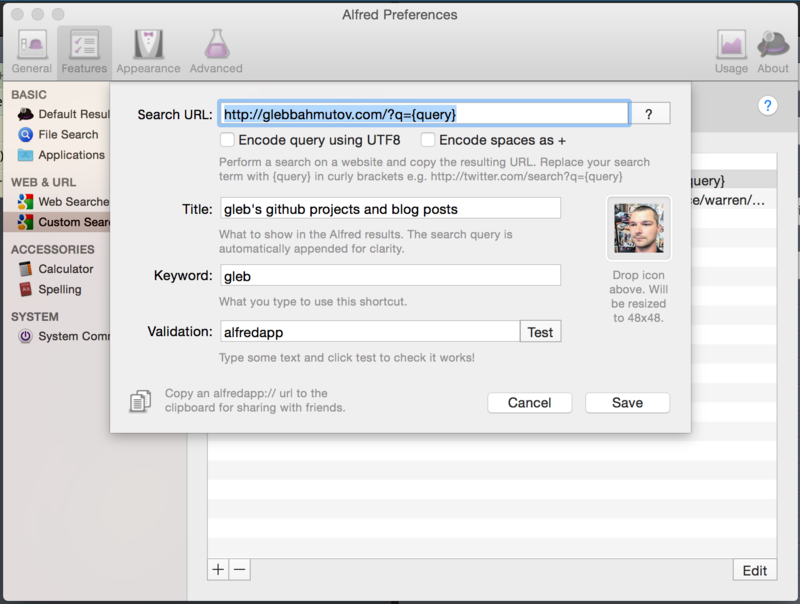 I configured a custom search in the Alfred preferences with the search url configured to point at the short search url above. After saving the above custom search, I can open Alfred using Option-Space shortcut, type "gleb" and then send the search query to the default browser. This approach is even faster than using the custom search engine in Chrome.